An other CP/M / MSDOS hybrid system. This computer had no great commercial success. The Decision Mate V came with 128 KB of RAM, but could be upgraded to 256 or 512 KB with expansion cards. The serial and Centronics interfaces were not on the mainboard, but were added as expansion cards. An additional card with a 68000 was developed by NCR in order to use CP/M 68. There were 7 expansion slots. An optional diagnostic card was available for slot 6. Otherwise, diagnostics were produced through 6 red LEDs on the back of the case, above the volume control. 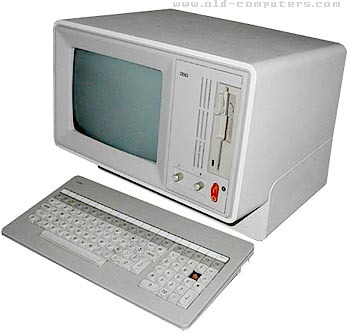 The computer had two floppy drives, or only one + a Winchester hard drive mounted in the second bay. A network called 'DecisoNet' was designed to link together several Decision V.
see more NCR Decision Mate V Ebay auctions !